Catering to more than collectors, Michael O'Dougherty houses an incredible collection of unique, handmade pottery and glazed ceramics. We get that tastes are varied as artist styles - that's why we carry a variety of casual and rustic designs right alongside intricate ceramics and domestic styles of pottery. Pottery isn't meant to just sit on a shelf. It's tangible, beautiful, and should be used. Whether for decoration or dinner, it's functional art that everyone can appreciate and enjoy. That said, you won't find mass produced or poorly made pieces in our collection. We tend to showcase pieces with colorful and distinct designs over the bland and banal. 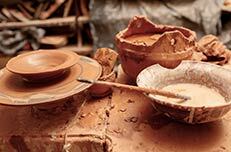 A lot goes into the art of ceramics and pottery making. Michael O'Dougherty offers a variety of workshops throughout the year for enthusiasts, hobbyists, and burgeoning potters. From beginning throwing classes to guest artist lectures, we help connect more and more people to ceramics and ceramic art.